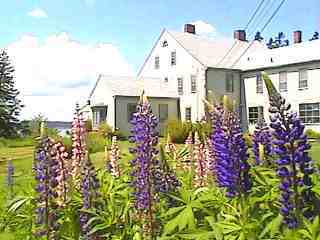 The Owen House is a large colonial inn on a headland overlooking Passamaquoddy Bay. It has a panoramic view of the islands on both sides of the Canada/U.S. border. It faces southwest, the rooms are large and sunny, and you can see the water from every room. Admiral William Fitzwilliam Owen, the son of the Welsh Captain who was granted the island in 1769, built the Owen House in 1835. 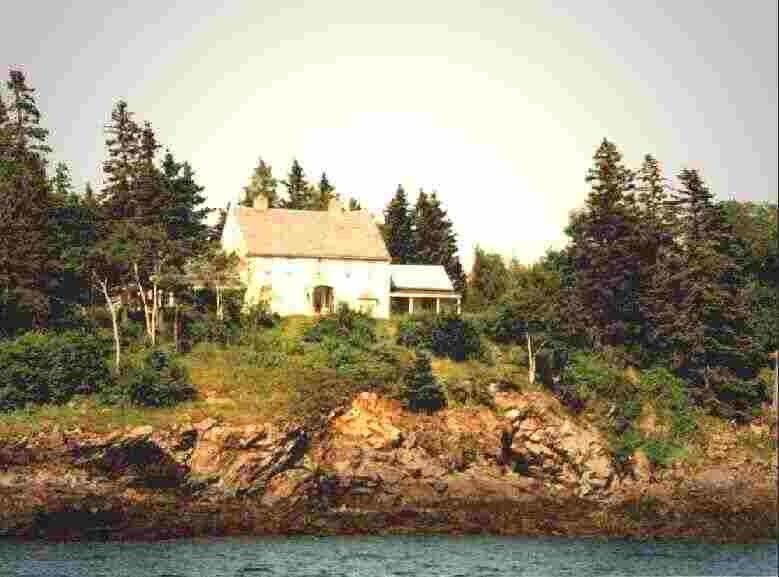 The Owen family ran the island of Campobello as a feudal estate for nearly a century. The old house still has most of the original construction, furniture from the 1800's, quilts and fireplaces, which add to its warmth and charm. There are nine guest rooms and seven baths. The second floor rooms each have a private bath and the third floor rooms (the servants had the best view) share two baths. Guests have the use of several large sitting rooms on the first floor, all of which open up onto porches overlooking the sea. Several people usually gather around a fire in the evening. The side of the house and the view from the front lawn. This is the house as seen from the wharf. 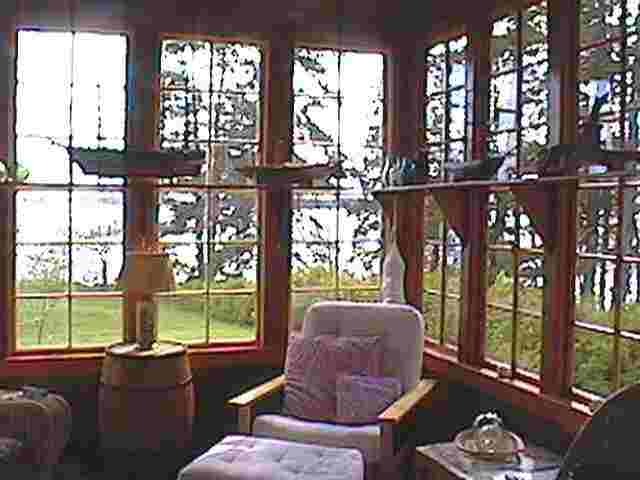 The house is on ten acres of land and far from road noise, except the occasional coming and going of the fishing boats at the distant wharf, and the sounds of gulls and waves. Everyone usually sleeps well because of the salt air and the silence. 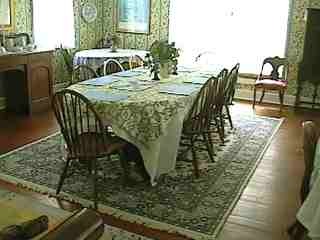 In the morning guests gather around the large table in the sunny dining room for breakfast. We have unique and interesting people who invariably find something in common. Often long discussions occur over lingering breakfasts. We serve a full breakfast in the dining room. This is the sunny dining room. We often have wild blueberry pancakes and apple sausage, or we have yogurt and orange french toast and canadian bacon, or we explore new dishes. If we do not have a full house an option is feta, black olive and green chile omelettes. Another standard is Owen House scrambled eggs and either bacon or sausage. We always have in addition fresh fruit, orange juice, muffins and toast and coffee or tea. One of the many good things about the design of this old house is all the sitting space on the first floor. There are two sitting rooms, a gallery/meeting space and a large sunroom with TV and stereo. Also there are two large exterior porches that overlook the water. There is plenty of space to spread out and enjoy the house during your stay. we like to monitor their use. 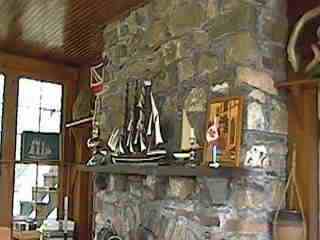 This is the sunroom with its beautiful fireplace, old ship models and panoramic view of the water. 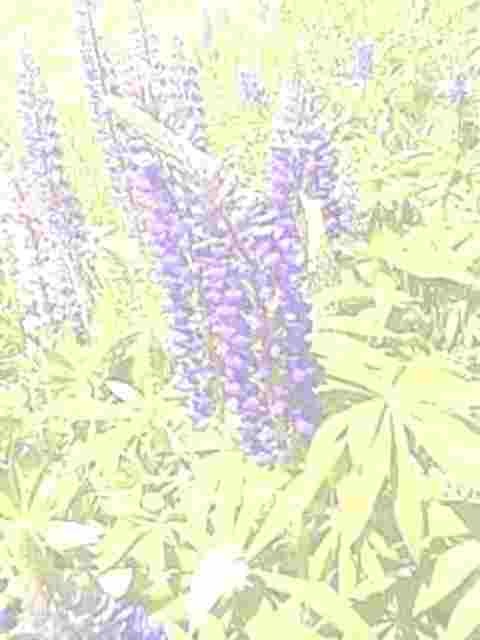 Campobello Island is located just two and one half hours north of Bar Harbor, Maine, and two and a half hours south of St.John, New Brunswick, Canada. There are several restaurants in the area. The Deer Island ferry leaves from the beach adjoining the Owen House. One can leave the car and go on foot to Deer Island and Eastport for an inexpensive sea journey. Campobello also has an excellent golf course. 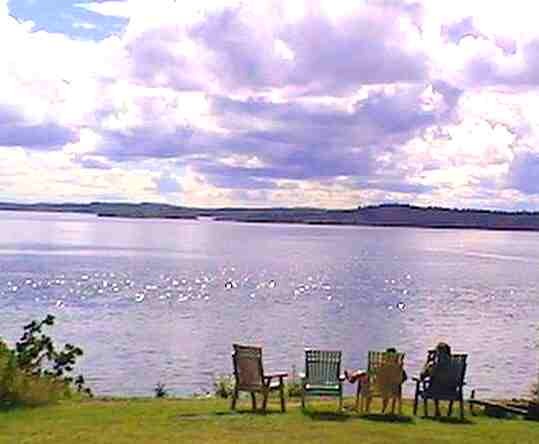 Owen House is on the same cove as the Roosevelt Campobello International Park which has FDR's summer "cottage" open to the public. The whole area has wonderful hiking in the International park, the Provincial park and West Quoddy Head State park just across the border. Whales are often seen from East Quoddy lighthouse on the north end of the island. We look forward to your stay with us . All rates are in Canadian dollars. Fair exchange rate given on U.S. currency. We accept Visa, MC, personal checks, Traveler’s checks, or cash (U.S. or Canadian). Please call for reservations or more information, 1-506-752-2977.